I spent some time today binding this book. 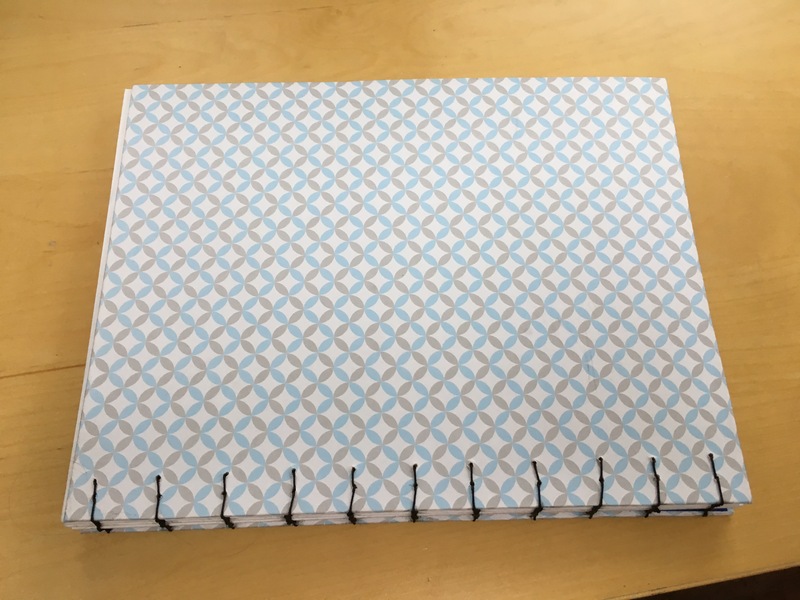 I had a bunch of 11×17″ paper left over from another project, so I arranged it into signatures/quires of six or seven pages each, and groups of six quires, to produce eight notebooks: coptic stitch sketchbooks. I like this size and heft; it feels about right. But boy, are they a pain to bind! The covers aren’t quite stiff enough with just plain cardboard inside them; there’s a lot of floppiness… or not floppiness, but flexibility. And you need about nine yards (it feels like, in reality it’s more like four) of waxed string to bind a book of this size, which is more than is convenient to work with at one time. And the black string combined with the wax leaves black marks on the paper… white waxed string, it seems, is the way to go so as to avoid staining the paper. Still, it came out all right. Not an entirely successful experiment, but OK, I learned a few things. Now what? What comes next? At this point, I’ve bound and given away four of these notebooks of this size. (Two were for my parents for their wedding anniversary — matching papers of the same pattern, in different colors). I have this one bound, which means that I have three more to bind. I think I’ll save them for days when I don’t have anything else to work on. 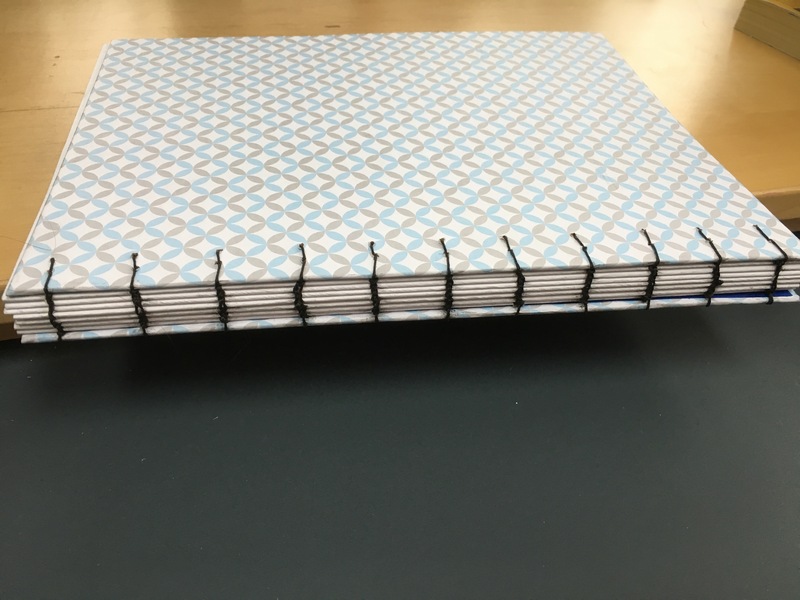 Some of my readers are teachers, and must wonder what the advantage is of doing bookbinding. I mean, MakerSpaces are really supposed to be about things like robots and 3D printers and AutoCAD and digital design…. aren’t they? Or aren’t they supposed to be about building things out of wood and plastic and metal? Yes, MakerSpaces are frequently about that — but let me say, those of us who teach or taught Maker work in schools are forgetting the importance of the soft skills, and of artisanship. It’s part of the reason why I taught knitting, and built inkle looms, and learned to spin wool. It’s part of the reason I learned to work a sewing machine, and to make costumes and hats and bags. But I’d like to offer the point that Making comes in many different flavors, and it’s not all electronics and gears and 3D printing. There’s fashion design and graphic design and book production and artisanship and cabinetry and furniture-making and mechanical processes and block printing and leather working and architecture and… and… and… the list goes on. The human experience is huge, my friends in Maker Education… and learning to do more than simply program pre-made robots or build circuits out of LittleBits is probably not enough. We have a whole range of things that our students are hungry to learn how to do… and there’s benefit in building up OUR skills so that students can see how to grow and expand their own learning processes to encompass other fields of endeavor. This looks so cool and fun! When my current writing project is done I’m going to take off a couple of months and do some arts and crafts before I start another one. Writing is “Making” I guess, but there’s something so fulfilling about creating a tangible, usable object with your hands. I agree that writing is making. But it’s less visceral, more intellectual. Making has to invoke some level of body or hand learning I tend to think.